L Got J to Eat Vegetables. Well…we would have posted a picture of dinner tonight. Except, we ate it all. 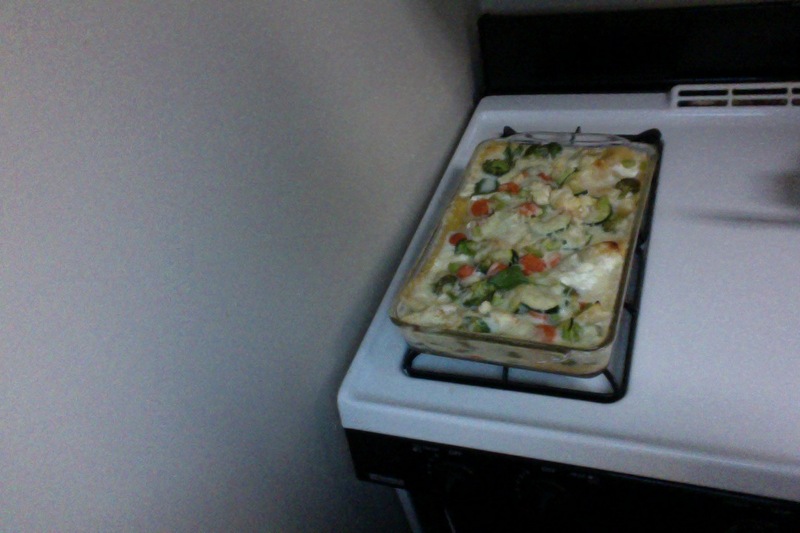 I surprised myself by finding a lovely recipe for vegetable pizzas with a twist. 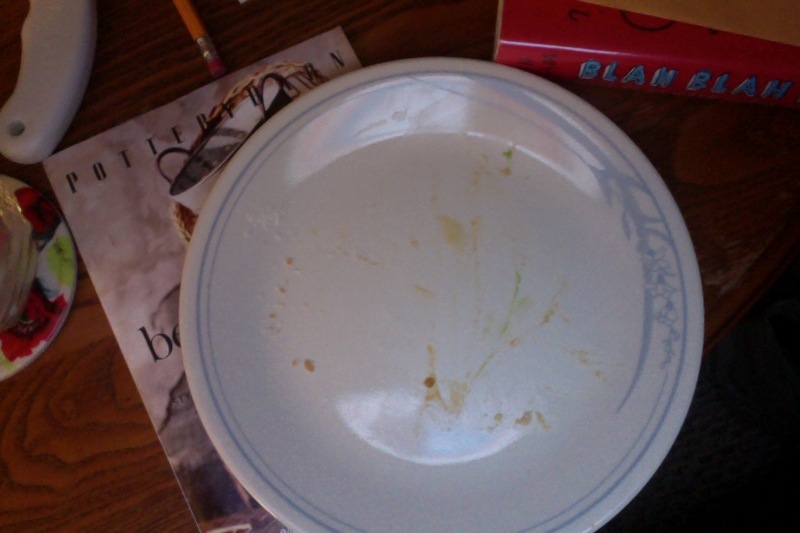 And J ate all of his (note: he is not a fan of tomatoes, peppers and sometimes cucumbers). Veggie “Tostadas”- basically a pizza-ish tortilla with a deconstructed guacamole and hummus combo. All of the YUM! 1. Preheat oven to 350. While waiting, place two tortillas on a baking sheet and brush olive oil across. Place in oven for 8-10 minutes (until crispy). 2. Chop tomatoes and peppers. Saute in olive oil until soft. 3. Dice cucumber and score 1/2 an avocado. 4. Take tortillas out of oven, and spread with some hummus. Crumble feta over top. 5. Sprinkle with S&P, and spread as many of the tomatoes/peppers, cucumbers and diced avocado as you want. So good. And healthy, nonetheless. Dinner cooked together is always better…right, J? Today was J’s first day of work- hooray! Today was my start of the weekend- hooray! To start our weekend, J and I decided to make dinner together and watch The West Wing together. We have been watching it on Netflix. We are obsessed. Anywho, we made this for dinner. It actually made this, plus a small loaf pan. SO MANY VEGETABLES. Oh, yeah. It is garden lasagna. 1. Boil noodles. Preheat oven to 375. 2. Oil in pan; cook onions with salt and pepper. 3. Once softened, dump into large bowl. Add oil back to pan (back on heat), and cook zucchini. 4. Once cooked, dump with onions. Add oil back to pan (back on heat), and cook broccoli and cauliflower. 5. Once cooked, dump with others. Add oil back to pan (back on heat), and cook carrots and celery. 6. Once cooked dump with others. 7. Other pan…flour and milk on the stove. Whisk thoroughly. Bring to boil. 8. Once boiling, remove from heat, stirring in parmesan and spinach, with some s&p. 9. In another bowl (if you have any left by now…), add cottage cheese and 1/2 of the mozzarella. Mix. 10. Grease a 9×13 pan, and dump 1/3 of the spinach sauce. Add three noodles across the pan. Spread 1/3 of the cottage cheese mixture onto noodles. Add 1/3 of vegetables on top. 12. Repeat 10 one last time. 13. Put the rest of the mozzarella on top of the lasagna. 14. Bake for 20 minutes covered, remove foil, then another 20 minutes to broil cheese. 15. Wait 10 minutes, serve and eat. We had ours with a nice Riesling. Yum. What else are we doing tonight? Assembling wedding invitations. Excellent. More wine! RASPBERRY SWEET ROLLS WITH CREAM CHEESY TYPE ICING. 1. In a small bowl, mix lukewarm milk, yeast, and sugar. Place a dish towel over the bowl, and let it sit for 5 minutes, while the microscopic yeast wizards perform their magical ceremony to make the dough bigger. Somehow. 2. Next, in a large bowl, mix the yeast mixture with 2 eggs, softened butter, and salt with an electric mixer. 3. Add flour into the bowl, 1 cup of flour at a time. 4. If you are like me, and don’t have a stand mixer, now is the time when you roll up your sleeves and knead the dough until it forms into a ball. 6. While waiting for the dough to rise, grab a small bowl. Mix together raspberries, jam, cornstarch and sugar. 7. On a flour-dusted surface, roll out the dough with a rolling pin (or, again, if you are like me and don’t have a rolling pin, roll it out by hand). 8. Spread raspberry filling on the dough, all the way to the edges. 9. Roll the dough tightly into a log, and cut into 12 individual rolls. 10. Grease a 9×12 pan, and place the rolls in pan. Bake for 25 minutes. 11. While rolls are baking, mix together cream cheese (softened), vanilla, milk and powdered sugar. If you want it a little thinner, just add more milk ( a little at a time). 12. Remove rolls from the oven, and let cool for 10 minutes. We made scrambled eggs while we waited. 13. Drizzle icing over rolls. Devour all the foods…ok. Just kidding. But we may have each had 2 rolls. 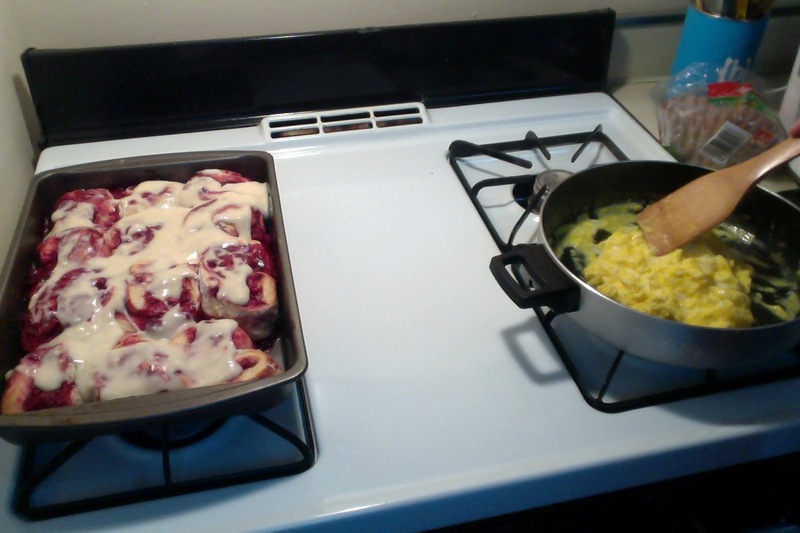 Breakfast is ready to warm up for tomorrow before church! We threw our first party! New Year’s seems like a great time to invite a few friends over. So, we did. And, we did it all for $100! We fed about 20 people and had hardly any food leftover. What do we have leftover? Cookies. So many cookies. Everyone brought at least a dozen cookies. We rang in the new year with good friends in our home, which was definitely nice. 2013 brings the year that J and I finally get married, after our 7 1/2 year long relationship. We are a little excited, to say the least. Looking forward to what 2013 will bring!